Hi friends, welcome to another week of Menu Plan Monday! I made it here to Ontario with my boys and am enjoying my visit with my family. I hope you all had a Happy Easter! We are having our Easter dinner today made for us by my Executive Chef brother-in-law. It will be amazing no doubt, can’t wait! One thing I notice here, that is leaving me with my jaw hanging open, is how inexpensive food is compared to Alberta where I live. Here are three big sales in the flyers this week that blew me away. Crazy! I don’t usually see prices that low. How does this compare to where you live? In other exciting news, my daughter turns 18 this week! I’m happy we’ll be home in time to celebrate with her, yay! Friday: Pizza Party Friday Night! That’s about 1/3 of the price here in the Washington DC area, but I’m used to the expense now (unfortunately). What part of Ontario are you in? I’ve not seen prices like that up here in Eastern Ontario. That and bacon is almost always a loss leader just to get you in the store. Have you noticed that a pound of bacon isn’t a pound any more? 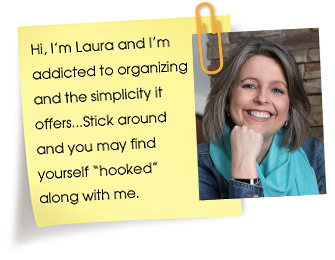 Hi Paula, I’m in Southern Ontario. I live in Westchester County, NY my guess is that only Alaska has higher prices than us. The flyers you put up would have been from the 1970’s here. As a frugal mom I live for prices like that. If I could travel the world to get those great prices I would be in mommie savings heaven! LAMS!! Anyway I love linking up here every Monday. Thanks for hosting this amazing party every week! Those are good sale prices here in Texas, but definitely a lot cheaper than every day ones. And bacon never goes on sale here! 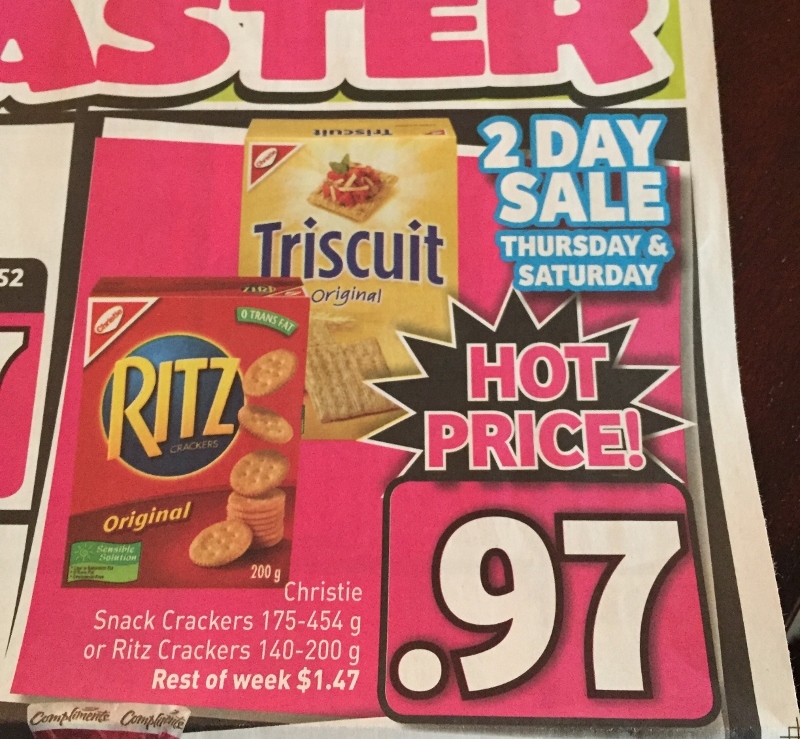 I live in Oregon, I can get crackers for about a dollar a box with a sale and coupon. 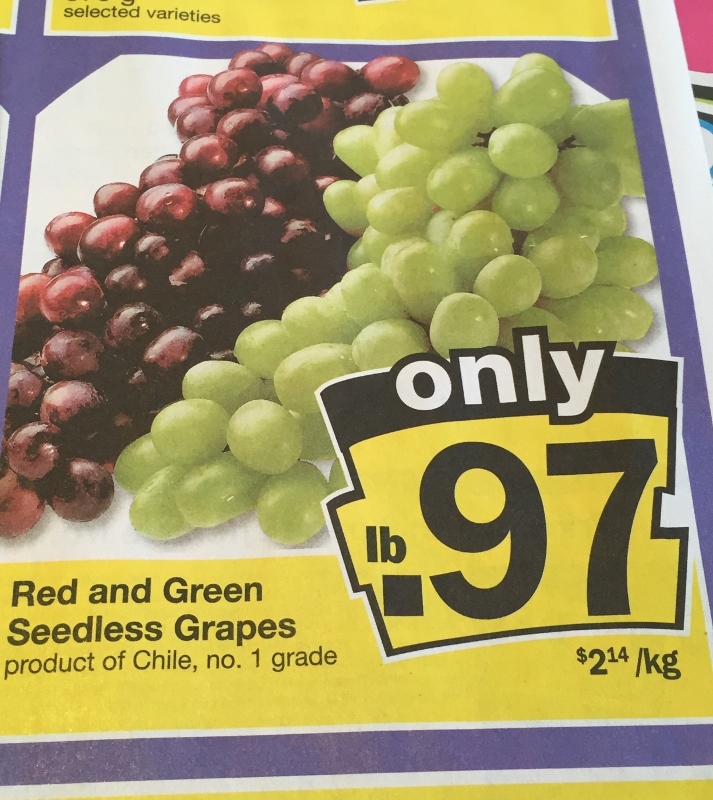 Grapes are usually around $1.50/lb on sale, but at our local discount grocery store I find them for $.49/lb. Bacon is expensive in our area and I rarely see it for less then $3.99 a package. 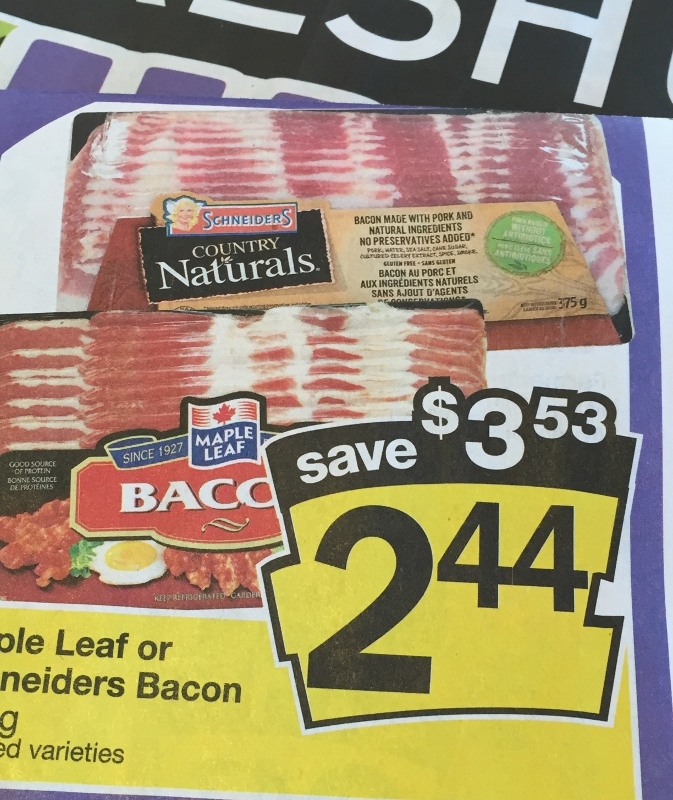 I’d love to stock up on some of that bacon …such a great price. I hope you enjoyed your stay with your family. Have a great week. We definitely don’t see prices that low here in FL. Happy Birthday to your daughter! Thanks for hosting! Those are some low prices! Have a lovely week! Those seem on par with sale prices here in the Kansas City area. The bacon sale price definitely beats the ones I’ve seen lately though. Hope your daughter has a wonderful and happy 18th birthday! I’m fortunate to live in the Upstate of South Carolina where the cost of living is very reasonable…but I’ve never seen Ritz crackers for $1! I can get them for $1.50 with a B1G1 Free sale and a good coupon, so I’m not complaining. 🙂 Enjoy your family time this week! I’m in Florida and I haven’t seen prices like that in YEARS. I am out in Northern BC and have not seen prices like that in a long time! If those crackers were on sale it would be for $2 a box. And bacon, so expensive now!